I just upgraded to the new version of Astaro yesterday. Now called Sophos UTM 9. Love the new interface and etc. However there is an issue with XBOX Live connecting. I restored my config from Astaro 8 which has worked for well over a year so I know it worked until yesterday. The issue is from the IPS (Intrusion Prevention System). If you disable IPS XBOX Live works again. So for now because obviously you do not want to disable IPS. I created a static mapping for the XBOX under DHCP so that it will get the same IP address each time it starts up. You will also want to create a network definition for your XBOX with the IP address that it will get from DHCP so you can use it in your rules. 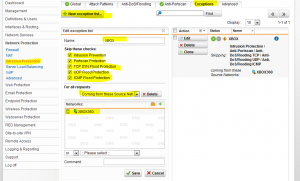 Now go to Network Protection, Intrusion Prevention, exceptions and create a new exception list as the screenshot below. Hopefully this will help someone out there. And hopefully this will be resolved soon with a new Snort/IPS Rule.